This textbook has been written with the majority of students in mind. The book is particularly useful for students who are not math majors and might be intimidated by pages of formulas but could profit from an understanding of statistics. The book is divided into three parts. Part One contains material generally included in the most basic of texts, such as self-study, programmed texts. 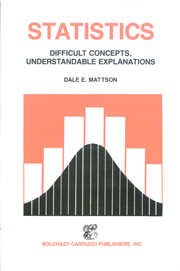 Part Two describes the principal concepts and rationale of inferential statistics. Part Three of the text contains descriptions of methods of inferential statistics usually included in second-level courses and intermediate textbooks. Worked examples including all calculations are provided, making it possible for all readers to learn how to make the tests. Part One and Two and selected lessons from Part Three represent a good introductory course for the person who needs to be an intelligent reader of the scientific literature. The concepts included in the text are applicable not only in the health sciences, but also in education, psychology, sociology, business, and other fields.